What happens when you mix a sports yacht with a supercar? That’s exactly what the Princess R35 is, a dayboat designed by Pininfarina, made entirely from carbon fibre, and with a trick hydrofoil system borrowed from Sir Ben Ainslie’s catamaran. The first of a new product range from Princess Yachts, the R35 is the smallest boat to come from the Plymouth yard, but what it lacks in size the R35 makes up for in performance and cutting-edge marine technology. The headline act is the boat’s active foil system, which is made up of two feet attached by legs to the underside of the hull. An onboard computer makes 100 calculations per second and can adjust the position of each foot 27 times per second. Instead of lifting it out of the water, like an America’s Cup catamaran, this has the effect of giving the boat stability control, helping to move more smoothly through the water as the foils move by up to five degrees up or down to dampen out vertical movement. Princess says water resistance is reduced by up to 30%, increasing performance and lowering fuel consumption. 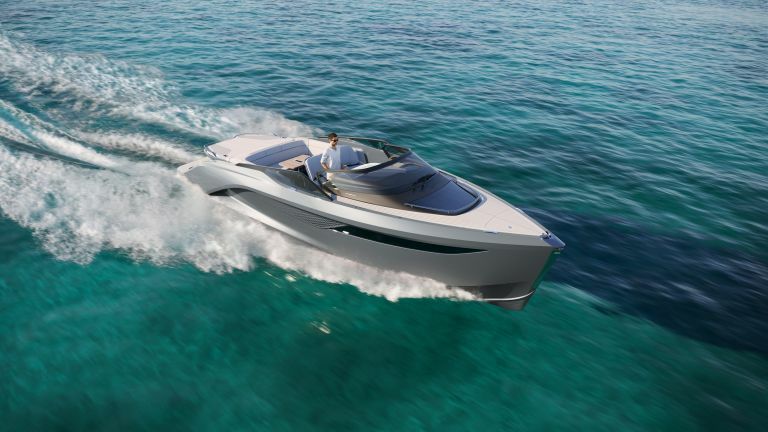 But the foiling system is about more than stability; this being an 860-horsepower sports boat penned by legendary car design house Pininfarina, the R35 has a sport mode. Activate this, and the foils now work to help turn the boat more sharply, giving agility previously unheard of in this sector of the market. Sheriff says Princess plans to add the foil system to its larger vessels in the coming years, where it will improve cruising stability and efficiency - the latter being key, given the masses of fuel larger boats have a habit of consuming. To that end, the company is also looking at hybridisation systems, where batteries could power a moored vessel in silence and with zero local emissions. The links between boat and sports car are no coincidence, as Princess is positioning the circa-£500,000 R35 at younger buyers than their larger vessels, and as an alternative to buying another supercar for a similar price. As such, the R35’s Pininfarina-designed body is reminiscent of mid-engined supercars, with its gaping intakes on the sides and aggressive yet sleek look. Pininfarina - famous for designing much of Ferrari’s back catalogue - also used some of its automotive know how to help reduce buffeting for passengers of the R35. This is because, taking a similar approach to that of a convertible sports car, air is fed around and over the R35 in such a way that turbulence towards the rear is reduced, and vortices are created to help reduce spray being kicked up behind the boat. Further links between car and boat are found in the R35’s hull, which is made entirely from carbon fibre - unheard of in this sector of the market. Sheriff told T3 how the shift from glass fibre to carbon cut half a tonne of weight from the R35 and increases rigidity - just as it does on carbon-tubbed supercars. Moving away from the tradition glossy white of most yachts, the R35 is available in a range of supercar-like colours, including metallic shades of red and blue, should the buyer want to match it with their car. Convenient, given Automobili Pininfarina is about to launch its first car, the electric, 1,900-horsepower Battista, which visitors to the Dusseldorf boat show in January could order alongside an R35 in matching colours, if they so wished. Below deck, the R35 features a wet room, galley, and living area with wraparound sofa, workspace, and a dining table which collapses into the floor. Once lowered, the table is replaced by a cushion, turning the sofa area into a double bed. This space features a bespoke sound system created by Naim Audio, which also builds premium audio systems for Princess’ large vessels. Such is the effort that Naim and Princess go to to produce premium audio, the two worked together on the R35’s system from the very start, with Naim asking for a seam right down the middle of the carbon hull. That way, the left speaker loads (vibrates, essentially) the left side of the hull and the right speaker loads the right; without the seam, the vibrations of each channel would converge across the hull and produce a muddy, disorganised sound.